What are the limits on observing multiple lines at edges of the IF or RF band (such as 12CO and 13CO2-1)? 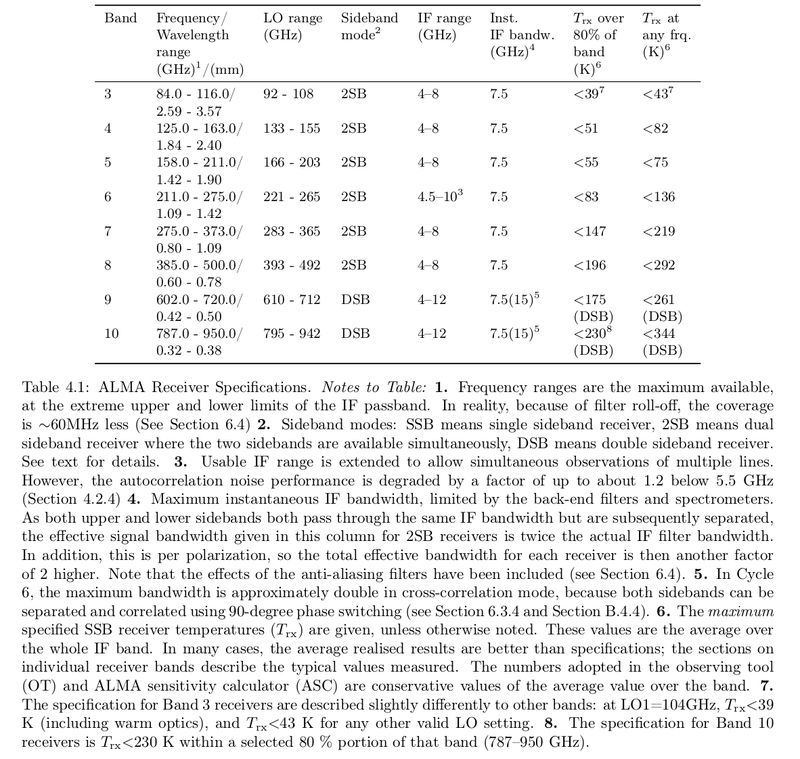 where BW refers to the total spectral window bandwidth (as chosen from the set of 2, 1, 0.5, 0.25, 0.125, 0.0625 GHz), and the min and max IF and RF ranges are listed in the table below (all values are in GHz). You can also find this table in the ALMA Technical handbook, Table 4.1. While there is ongoing discussion to relax this requirement, it currently restricts how close one can place a spectral window to the receiver band edge (RF) and to the baseband edge (IF). These restrictions are correctly implemented in the OT. The most obvious restriction comes in situations where you want to observe two lines at the extreme edges of the IF range. The 12CO(2-1) and 13CO(2-1) lines are a particularly important example. Here the lines are so close together that you must place both lines in the IF near the lower limit of 5 GHz. Thus, the velocity space available around the lines is quite limited, particularly when using the broadest spectral windows. As the spectral window bandwidth is reduced, the effective edge of the window gets closer to the true edge of the IF range, allowing a little more freedom. Below are three tables which define the usable range of IF for the various combinations of Band and spectral window. The specific case of 12CO(2-1) and 13CO(2-1) is shown explicitly in the Band 6 Table, including the central frequencies to use when defining spectral windows which will place these two lines equidistant from the band edges. Please note that if the redshift is different to 0, you may have to vary slightly the figures in the table. Cycle 6 Update: As of the start of Cycle 6, the Band 6 IF bandwidth has been increased by 0.5 GHz to extend from 4.5 to 10 GHz. This will enable12CO,13CO and C18O J=2-1 to be observed simultaneously with broader spectral windows. In the Band 6 table below, for all spectral window equivalent bandwidths the spectral window central frequencies are 218.2185 GHz for 13CO 2-1 and 232.7185 GHz for 12CO 2-1. There is also a known bug in the OT which affects spectral setups where the spectral windows are at the extreme edges of the IF. This means that the frequencies given below may have to be changed slightly (by fractions of a MHz) in order for a tuning to be found, in the sense that the spectral window should be moved away from its sideband edge. For example, the Band-6 setting given below for the 117 MHz-wide spectral window would work (for zero velocity) with frequencies of 220.4060 and 230.5311 GHz (a change of 100 kHz in the higher-frequency spectral window). *These windows are sufficiently narrow that the lines can be centered in them.